Second release by the Gunrunnerz crew, aptly featuring some gunrap tracks of the finest caliber. Gunrunnerz are: Lord Tariq, Peter Gunz, Triple X. There’s also a female mc on a few tracks and another dude, but i didn’t really understand their names in one of the intros. 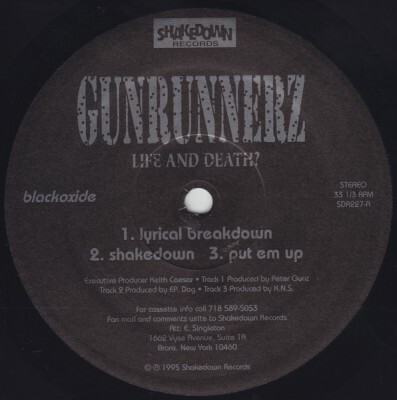 comment "Gunrunnerz – Life And Death EP (Vinyl) (1995) (FLAC + 320 kbps)"